Put this one on your MUST SEE list! Should we start inside? 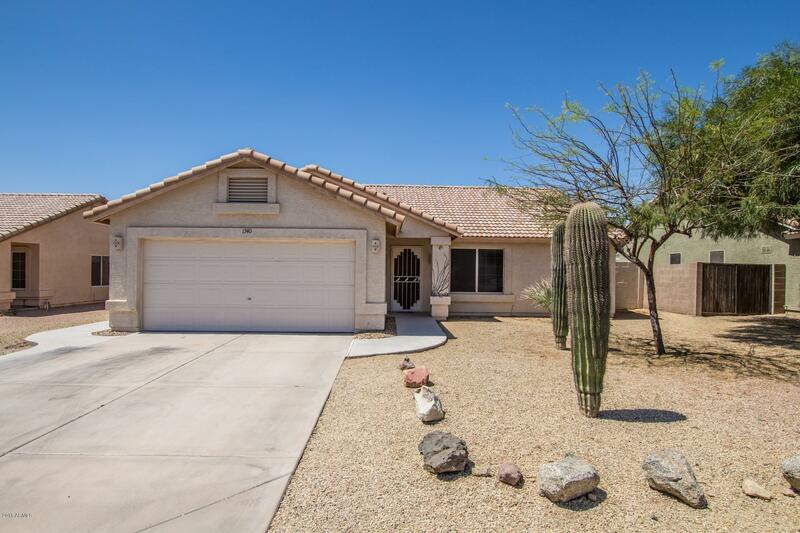 Beautiful tile throughout with vaulted ceilings - The open, split floor starts with a spacious great room and veers left to two bedrooms and a bath. One is set up as a den but could become a bedroom by adding the door back on. On the right side of the home is the giant master bedroom with custom french doors, leading out to the yard. Gorgeous and upgraded - the bathroom has an unimaginable walk-in shower along with a gigantic closet. The bright, open kitchen has tons of storage and corner lazy susan cabinets to make the most of the space. This set of french doors look out to the AMAZING back yard. If you like to be outside or entertain, you must see this yard - As you walk outside onto the gorgeous Travertine you'll see a bar to the left wired with music, lights and a TV. There is a fridge, a sink and storage for everything you need! The tiniest details were considered here - Corian countertops - hooks, lights; a place for everything. A little further back is the brand-new, covered, built-in BBQ that is a chef's dream. Soft-close drawers, a sink, additional electricity and a burner - gorgeous! The pool is pristine, there is a side yard for the pups and a built-in shed. Beautiful!